JACKSON, Tenn. — The Crump Police Department is effectively disbanded. The police department’s lights are off, and the police cars are left in the parking lot at City Hall, because no one works for the department anymore. “The chief and I had a conversation the Tuesday after I took office,” Mayor Ricky Tuberville said. He says the conversation was about the future of the department. “He requested that we lay him off so he could spend time with his kids and grand kids during the holidays,” Tuberville said. According to minutes from the town hall meeting, citizens are concerned about the plan with the new mayor. “It’s not that there’s no plan to hire any officers. We’re still looking at all of our options,” Tuberville said. At the town hall meeting, the mayor said he’s going to let the Hardin County Sheriff’s Office handle the patrols in the area until they can come up with a plan. “We’ve always assisted them on calls, and if they didn’t have an officer on duty, then we would take care of their calls for them,” Hardin County Sheriff Johnny Alexander said. Sheriff Alexander says he wasn’t informed about his decision. “Read it in the paper, then I heard the local gossip,” the sheriff said. 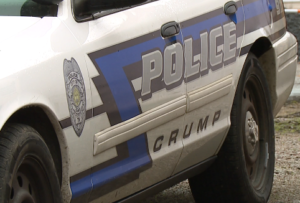 However, that will not affect the office’s duty to the people of Crump. “It’s business as usual. If we need to be over there, we will,” Sheriff Alexander said.